The writer V.S. 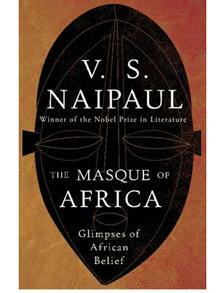 Naipaul recently published a book, The Masque of Africa that is supposedly based on his recent visits to African countries like Uganda, Ghana, Nigeria, the Ivory Coast, Gabon and South Africa. These travels were allegedly to discover the “nature of African belief” according to this review of the book by Sameer Rahim in the UK Telegraph. Rahim gives the clear impression that this book does not improve upon the silence. It is the same tired, stereotypical garbage about Africa and civilizations of color. You wonder if at 80 years of age, Naipaul is finally losing it. The drama Naipaul records in the book is cringe-worthy: In Gabon, his legs give way and someone attempts to transport him in a broken wheelbarrow. Give us a break! The sad truth is that ever since Naipaul was born among the wretched of the earth, as he would probably put it, he has struggled obsessively to escape his skin. He fills great books with reams of self-loathing. The more he tries to escape his past, the more he is rejected by the interlocutors of his present. His interviewers never fail to notice this little man of color in a tweed jacket huddled in an English countryside abode. Almost every interview of Naipaul mentions with breathless wonder that this man from India via Trinidad is dressed – in a tweed jacket. It is the ultimate rejection of his claim to another civilization, and humanity. Just like us. Naipaul is us. So, who cares what Naipaul and his ilk say about Africa? The African intellectual from the beginning has been frustrated by the constant label of “the other” that is implied in how Westerners view Africa and her inhabitants. It just seems like as people of color, there is nothing we can do or say that lets even our most liberal Western friends view us as part of a bland, no-drama humanity. It understandably upsets us, and when Naipaul, one of us, joins in the heckling, we froth in the mouth. There is plenty of blame to go around, but African intellectuals refuse to accept responsibility for any of the blame. We have abandoned the peasants who spent so much to get us an education so we could get them out of hell. We are in pursuit of our own needs, screw the people. Wine glass in hand, we mouth white words to white-out what we view as our frailties. Why would anyone look at the charade that is governance in today’s Nigeria and respect it? It is taboo to talk about these things; we say it is self-loathing and racist. With the awesome power of the white man’s own words we bully the West away from the table of dialogue. In secret, we admire these strange people that see tomorrow, and go into it fighting. They are next to their God, the Narcissus who sends mean armies after us in gleeful hunt. We obsess about what people think of us. I say, get over it; they probably believe we are pretend humans. A pox on their houses. We are not savages. The real savages are the racists in our midst. Possessing only primitive instincts, bereft of thinking skills, they shudder at the other. Racism is savagery; it diminishes the perpetrator and assigns humanity to the garbage heap of Early Man. Only savages would spend trillions on an unnecessary war against those who cannot tell nuclear from noodles. Ask the Iraqis. There is no defending Naipaul. Achebe already deconstructed Naipaul’s demons and I couldn’t agree with him more. But I say it is time to move from yelling at racists, real or imagined, to reflecting also on our role in this mess. Naipaul’s A Bend in the River was written over four decades ago. Today, black Africa may have regressed from that point in time. Why are things the way they are? We get defensive and yell: “Can’t you see, we are human like you, we wear suits, and we eat ice cream with cutlery!” “We are like you!” is our best defense against charges of our human ineptitude. Yet, our leaders can barely sustain what passes for modern society, even when they are given all the resources. They steal it and invest in pretend processes. Let’s face it: What is racist about pointing out that much of black Africa is a farce today, many thanks to us her intellectuals and leaders? Raheem observes this about Naipaul: “Perhaps, like his father, he is worried about what he sees when he looks in the mirror. Is he the Nobel Prize-winning sage who has written 30 acclaimed books over 50 years? Or is he a fraud, pretending to be a country gentleman in Wiltshire when his true home is among the wretched of the earth?” The question should be directed not only at Naipaul, but at all of us, fighting gamely to flee the condition we were born into. We may be blue-suited frauds pretending to be country gentlemen even as we ignore the travails of our fellow wretched of the earth. Ikhide R. Ikheloa is a literary critic, writer and columnist, and can be reached at xokigbo@yahoo.com . He blogs athttp://xokigbo.wordpress.com/ . You can follow him on Twitter at @Ikhide .